Amodal Suspension was a large-scale interactive installation where people could send short text messages to each other using a cell phone or web browser that was connected to the address www.amodal.net. 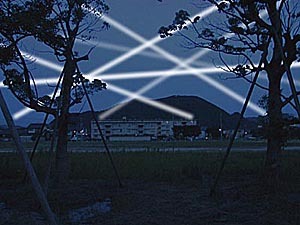 However, rather than being sent directly, the messages were encoded as unique sequences of flashes and sent to the sky with a network of 20 robotically-controlled searchlights. The signaling was similar to Morse code or the flashing of fireflies, the lights modulate their intensity to represent different text characters. Each message, once encoded, was suspended in the sky of the city, bouncing around the YCAM center, relayed from one searchlight to another. An email was sent to the intended recipient to notify him or her that a message was waiting for them in the sky of Yamaguchi. 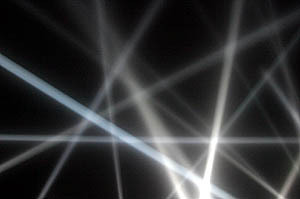 Each light sequence continued to circulate until the recipient or somebody else caught the message and read it. To catch a text, participants had to again use the cell phone or computer programs provided at www.amodal.net. To highlight the irony of globalization, the piece employed an automatic translation engine between Japanese and English, this produced inaccurate but charming results. 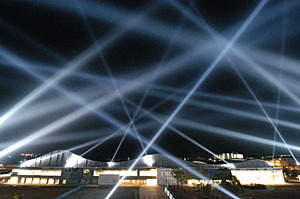 Once a participant read a message, it disappeared from the sky and was shown briefly on a large projection on the façade of the YCAM center. The author of the message was notified by email, as was the intended recipient. All submissions were logged at the project archive using an online virtual environment that showed them in three-dimensional patterns of Brownian motion. Visitors were able to search, sort and navigate through the archived messages. Amodal Suspension created an interactive mesh of light over the city, a floating cloud of data that could be written to and read. The piece provided a connective platform in which local residents and remote participants from different regions and countries could establish ad hoc relationships. While visualizing the traffic of information on an urban scale, the piece was also intended as a deviation from the assumed transparency of electronic communication. With 140,000 Watts of power and visibility around a 15 Km radius, Amodal Suspension intended to blend the virtual space of the Internet, the relational space of cell phones and the emblematic architecture and setting of the YCAM center. The piece was live for three weeks, from November 1st to 24th, suspending messages from dusk to dawn. Visit the section labeled participate and your browser will load a Java applet with a real-time 3D visualization of the YCAM center and park. The 3D window showed exactly what was happening in Yamaguchi at any given point in time while the project was live (currently it just shows an offline queue). You can change the point of view of this 3D world by dragging the mouse or by using the navigation tools under the window. To send a message, simply enter it in the space provided with your name and location. If you would like to be notified when your message is caught, please enter your email address. If you would like to specify a particular recipient for the message please enter his or her information on the bottom right, the person will be notified by email that you sent them a message that they can retrieve by visiting the project website. Please note: all messages are public and can be read by anyone, however, the email addresses are strictly confidential and will only be used for notification. To catch a message, you can select the catch tool that is under the 3D window. As you roll over a light ray with the mouse cursor you can see the name and location of whoever sent that particular message. If you click on the light with the catch tool the message is revealed to you and the author and intended recipient are notified. Right after this, the message is removed from the sky, shown on a large projection in Yamaguchi, and finally placed in a 3D archive where it remains in Brownian motion with the rest of the messages received by the project. 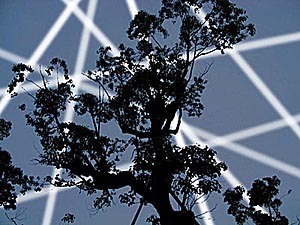 The bouncing messages follow amodal patterns derived from Buckminsterfullers notion of tensegrity, attempting to distribute information loads over all the nodes of the searchlight matrix. The endlessly errant message is meant to refer both to the labyrinthine circulation found in the writings of Jorge Luis Borges and the Japanese tradition of Omikuji fortune knots. The encoding of text messages into light flashes is quite inefficient, only about 2 Japanese and 4 roman characters per second. This gives the installation charm and also a rhythm and speed that the eye can detect (even if it can't decode it). What we see is the message density, not the story. If we wanted to be "efficient" we would use lasers, which can transmit 1.5 gigabits per second; but then again why be efficient? This project is not about communication, it is about relationships. We want to slow-down communication to an urban level, to make it tangible. Messages are public and anyone can read them even if they are sent to someone in particular. If only two people are writing to each other, a message can have multiple states of suspension, of in-between, never quite arriving. This third state between sending and receiving is a gap of intense poetic lines-of-flight. The light beams are themselves the vehicle for the transit of messages. The effect that you see from the city is that of the circulation of "light switches" as searchlights form vectors between them. If no one reads these messages they will remain in an endless state of suspension over the city. If no one participates the searchlights will be off and we won't see anything. We need to calibrate the searchlights in 3D so that we can guarantee that the light beams will only hit switch nodes...and these will be carefully chosen to avoid disturbing neighbors or drivers or the bird sanctuary in the mountains. 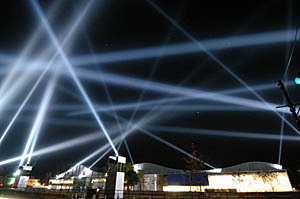 The best way to view the installation is from anywhere inside the perimeter of the searchlights. The beams will fly quite low (not hitting any buildings nor the ground) so it will be a canopy overhead. One of the important features of this distributed arrangement is that there is no privileged viewpoint for VIPs. Everybody gets a partial view only. There is no such thing as a complete, objective view and this is good conceptually. The cell phone interface is important because it is so prevalent in Japanese society and because it allows people to send and catch messages on the site with their own personal technology, adding intimacy. The mobility allows people to stroll through the data cloud and participate from different vantage points. Finally, the fact that cell phones and local access terminals are on site means that the piece is not a passive spectacle but an intervention dependent on public complicity. the piece is better compared to a water fountain in a public square than to a son et lumière show. Message nodes, information fabric, airborne message suspension, atmospheric photospheric, open, participatory, post cards, non-linear, non-narrative, tensional integrity, message turbulence, interception, otherception.